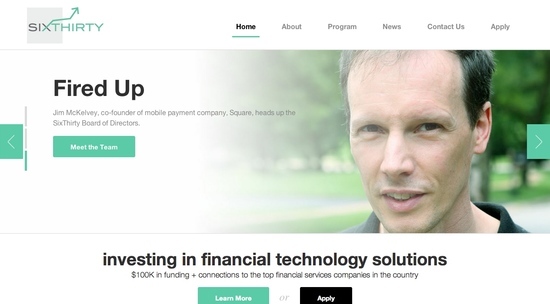 Earlier this week, a new fintech accelerator emerged out of the Silicon Prairie. St. Louis-based SixThirty announced its inaugural class of four fintech startups, selected from a pool of 100 applicants, that will take part in the 16-week incubator program that starts next Monday. Hedgeable is a next generation Vanguard, providing low cost, risk managed investment products in response to the Financial Crisis. Through a patented process, miiCard leverages access to online financial accounts to verify an individual’s identity beyond a photo ID through a simple process that occurs completely online in five to ten minutes. See miiCard’s FinovateFall 2013 demo. Upside uses innovative financial science and beautiful UI to provide goal-based investment management to mass affluent young professionals. XYverify enables consumers, merchants and financial institutions to reduce costs and prevent fraud via a mobile authentication platform. Along with each receiving $100k, the companies will have access to mentorship and connections to top financial services firms. Four more companies will be selected for the Spring program. The application window for that program will open in mid-December.